1/2" Thick Post Protectors. A simple and inexpensive way to absorb the truck impact and head off the damage to rack frame. Standard models fit around rack posts up to 4" wide. Base plates have four 9/16" mounting holes (fasteners not included). 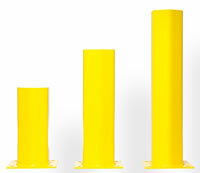 Made of steel and is bright yellow powder coated steel. Available in 12" 18" and 24" high models. Seismic footplates available.